The train rumbled by on tracks close to our window, maybe fifty yards away. The bed shook with the passing vibrations, jostling me from the half-sleep I’d fallen into. My daughter lay curled up beside me, pressed as close to me as she could get, fingers clenched and knotted into my tshirt. She slept deeply now, peacefully, her even breaths no longer broken with jagged sobs. The tears that had dried on her cheeks now slid silently down my own. The rhythm of my accusing thoughts matched that of the train. What was I doing? What was I thinking? Why are we here? It was our first night in London. We’d been traveling for nearly eighteen hours. Exhaustion didn’t begin to describe our condition. My girl is a trooper, though, hanging in with good spirits until we finally collapsed on that small bed in the even smaller hotel room. It was then that the enormity of what we had done finally hit us: We were in London. A different continent. Half a world away from everyone we knew. Now she slept and I lay awake, wondering if I’d told her the truth. This trip had made so much sense back in January when we first planned it. The unfeeling, relentless days had marched us straight into a new year, a year in which Kevin never was and never would be, and the agony of that realization – that life was going to keep going on whether I wanted it to or not – was almost too much in the middle of what seemed like the most frigid, snowy, long-lasting winter ever. Cold, lonely, grieving; I was desperate to connect with Kevin again. Somehow. In some way. I had to bring him into this year with me. I had to share something with him again. Somehow. In some way. I missed him so much. A trip to his favorite city seemed the perfect idea, and our girl – always up for adventure – was on board. Is this right, Kev? Did I make the right choice? Are we supposed to be here? I just don’t know right now. Kevin loved London. More than any other city in the world. Our favorite movies were set in London: Notting Hill, Love Actually, The King’s Speech…the list goes on and on. I heard the story of how badly his 15-year-old self wanted to visit the Imperial War Museum so many times, I am sure I can repeat it to our girl with just the right amount of certain resignation that he would miss it, and the barely-contained excitement when his dad finally made it happen. If Kevin could’ve picked any time to travel back into, hands down it would’ve been London during the Blitz. London…World War II…danger…adventure – his blue eyes snapped with exhilaration when he imagined how thrilling it would’ve been. I felt certain he would be in London with us and we could share another adventure, explore another city, and I could create more connections for our Bear, weaving our London stories with Daddy’s London stories to make our family memory quilt bigger and stronger. And more, I felt like this was the place we needed to start, my girl and I. The place where we’d find out if we could have this kind of adventure without Daddy right beside us. We’d finally created a routine, a rhythm to our days, mindful of what we desperately missed, but trying to keep filling life with joy. Could we step out of that comfort zone and function in an unknown place without him? I had to find out. Kevin and I had dreamed of the places we’d take our Bear; he wanted to give her the world. I couldn’t shut the door on that dream, though the coffin lid slamming down crushed so many other dreams we’d shared. Right now, in the middle of the night, well, I wasn’t sure. I just hoped I’d made the right decision. The sun shone brilliantly on us the next morning and, armed with a granola bar, a camera, and a map, we headed out the door and up the street to Buckingham Palace. Once in, my girl sneaked a swipe at the Palace walls, brushing her hand against decades of history. Her beloved Dora Hair took the game a little farther and jumped across the velvet ropes in the Marble Gallery; we retrieved her quickly before she could get up to more dolly mischief. A quick lunch at the café in the garden, and we were back on the bus heading to the London Eye. I wanted this day to be memorable, magical, kid-friendly – a day Beary would nod at and think, “Yeah, that was kind of awesome.” When the Eye’s capsule lifted us gently into the city sky, her whole being quivered with excitement; her hands flapped wildly, unable to keep up with the delight coursing through her. The happiness beaming from her grinning face bounced off the windows of the capsule and I absorbed all her joy, reflecting it back to her in a smile we captured in a London Eye selfie. “Mama, can I have some ice cream?” she asked when we finally had to leave the clouds and walk on land again. I guided her to a street vendor at the end of Westminster Bridge and handed over a couple of pounds for a frozen treat. Holding her cone, she carefully descended the stone steps to the Queen’s Walk and we found an empty bench facing the Thames. 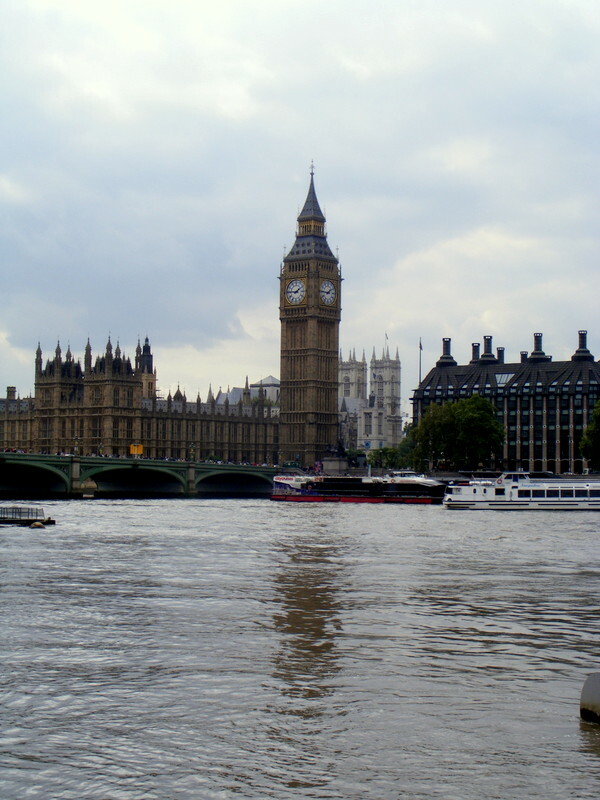 She started licking her ice cream and I stared across the river, across the bridge, at Big Ben. As if my stare demanded a performance, the big bell started ringing out across the city in the familiar tune. It was starting to feel good, being here. We had hit our stride, and were getting caught up in the bustle and flurry and majesty and history. It was starting to feel like I’d made the right decision, like we’d chosen the right place to start an adventure. I hadn’t lied to her after all. We were having fun; I was starting to feel happy. Thank you for finding us, Kev, I thought. I needed you to tell me this was the right thing to do. I’m so glad you’re still right here with us; I didn’t want to do this without you. P.S. We had a marvelous time; it was an adventure we’ll never forget. Just as Kevin and I had hoped, the traveling bug has bitten our little Bear and she and I are already planning our next trip — knowing that Kevin will be with us the whole time. I’m giving her the world, Kev…just like you wanted. We could hear the strains of the national anthem as we hurried across the immense parking lot, headed to the main gate. A light breeze, unusually cool for July, fanned our rushing faces. I pulled the folded-up ticket printouts from my pocket, ready to hand them over to the guy with the scanner, even as I passed my bag to the woman who gave it a cursory poke then waved me on. My girl tugged on my hand, reading off the numbered sections. “C’mon, Mama. Keep going this way.” And we walked and walked and swerved to avoid giggling groups of teenage girls in team shirts. Finally Bear announced, “Section 201. Here it is, Mama!” And we sank into our seats as the first inning played on. She nodded, eyes on the crowd, on the sun-setting sky, on the ads flashing across the electronic billboard across the field from our seats. Taking it all in. She’s like her Daddy; she loves coming to a baseball game. We snapped a quick selfie, posted to Facebook “Great night for a ball game! This one’s for you, Kevster”, then I sat and wondered. Wondered if we were doing the right thing. The game we came to last year, just after Kevin died, was so…magical, I guess, for want of any other way to describe it. Could we capture that feeling again? Capture feeling Kevin so close to us? My girl insisted on this tradition, insisted that we come to a baseball game, but did she know that it might not feel the same this year? My eyes gazed across the field, to the first base line. We’d sat there for a Yankees game nine years ago. Me, about twelve weeks pregnant with the Bear and down with morning sickness all day long. The drive into the city had nearly done me in, and I was nauseous and unsure about being at a baseball game. But it was the Yankees, and Kevin’s little-boy excitement was pretty contagious. Determined to help me feel better, he bought some Sea-Bands at a local drugstore, little elasticized cloth bracelets that applied pressure to take away seasick feelings. I was skeptical, but willing to try anything at that point. At the game, we asked a woman in the row in front of us to take a photo, and it’s one of my favorites. We’re both smiling – Kevin because he’s about to see the Yankees, and me because for the first time in three weeks I wasn’t doubled over heaving. That was something special, for sure. Just over a year later, we were back at the stadium, this time lugging a diaper bag and a baby girl. She slept through most of the game, and Daddy fed her a bottle when she woke up crying. He was so proud to bring her to her first baseball game. I didn’t know exactly how proud until sometime during a break between innings when giant messages started streaming across the jumbo-tron, and suddenly there was our daughter’s name with a big welcome from the baseball team. Then I knew why Kevin had asked for the camera. He stood snapping pictures of the message and the bright stadium lights were nothing next to the love shining from his face. I should’ve known he’d do something to mark the day. I have a photo of him holding Bear and her bottle, and it’s one of my favorites, too. Something special. Another year passed, and we headed back to the city for a baseball game. It was a giveaway day at the stadium and as we walked through the gates, a guy handed Beary a stuffed koala bear. It was nearly as big as her tiny 16-month self; she grabbed it with both hands and a big smile broke out behind her binky. Nothing could tear her away from her new toy. We hadn’t counted on the weather turning cool and rainy, though, and I’d forgotten a sweater for my girl. So Kevin searched a couple of stadium gift shops until he found a child-size team jacket. He paid way too much for it, and it was too big, but we rolled up the sleeves and she was warm and snug, thanks to her Daddy. Again, a kind stranger took a photo of the three of us – and the koala bear – and, yeah, it’s one of my favorites. Kevin’s arm around me, the Bear on my lap, with her bink and her bear. Something special. The game played on. And my girl kept finding signs of something special about to happen. A bit of cloud floating down in front of us — Daddy watching the game, she said. A bright flashing ad for her favorite long-term parking spot at the airport. A triple peanut – very rare, she informed me. And then, I heard it. Just a handful of notes at the beginning of the crowd sing-along and my girl and I looked at each other. Stared at each other in disbelief. She was right. Something special happened. I thought about how I’d felt just a few innings before. Wondering if coming to this baseball game was a good idea. Wondering if we could capture the magic of Daddy with us one more time. I should have known better. I should have known that being in that stadium, with so many wonderful memories, where we shared so many great times, would be a good thing, a special thing. It always has been. I should have known he would still be with us, and we’d feel all the love he ever gave us, ’cause it goes on and on and on and on. Cancer couldn’t stop it; death can’t, either. That kind of love is something special. I don’t know how you pulled that one off, Kevster, I thought, but I’m glad you did. I heard her humming as I worked in the kitchen. I only caught snatches of the tune, as she danced around the house – always in motion, always so busy — and couldn’t quite put it all together. I followed the drifting melody into the classroom, where she’d finally lighted in her chair to read. Sprawled sideways, one leg flung over the arm of the chair, my little mini-Kev hummed absently as her thumb and finger rubbed the corner of each page, then turned it carefully. I stood silent in the doorway and listened. The life of rosy hues. Of beauty and love and hope. She looked up and saw me. “What’re you doing, Mama?” she asked curiously. Her eyes sparkled. Her Daddy’s slow grin spread across her face. “I heard it when you played that French CD,” she offered. In a blatant cultural mashup, I’d had the sudden urge to listen to a CD of French songs while making scones earlier in the day. Kevin gave it to me one year for Valentine’s Day, and it seemed a good choice because I wanted something lilting, something to chase away the winter, something… joie de vivre. The hardest morning of my life was the day after Kevin died and I woke up to the devastating emptiness of life without him. I had his pillow, filled with my tears, and our daughter, filled with his spirit. But I didn’t have the life I’d had the day before, the life where every day had joy, the one where even moments of terrifying sadness were filtered through the love we shared and it always felt like everything would be okay…we would be okay. His whispers of love did something to me – he made me believe we would always find the joy in living. In the days and months after, I struggled. I couldn’t find any joy in anything. I was too numb to feel, then when that wore off, the searing pain of being without him left me gasping and crying and screaming for him to come back. I felt nothing in-between – it was unfeeling coldness or agonizing loneliness. And then one day, I woke up and my Bear giggled in her sleep and I felt that space in between. There is a place between the numbness and pain, I’ve found. A place of calm; not peace, really, but a place of stillness. There’s something like strength here, and something like hope. It’s a place to catch my breath…for just a moment, and I need that place sometimes because I need to breathe. When the grief bears down, I hold myself together with prayers and tears until I can crawl to the in-between for rest. The holidays, my girl’s birthday – getting through those without Kevin drained me of the energy I needed to keep on, to be in this new year without him. I treasure the in-between, because the other — the numbness and searing pain — they’re still here; I feel a version of them each day because I always miss him. But in the in-between, joy and hope rise a little higher than the grief and pain. They’ll be back, I know, because grief ebbs then crashes back in. But in the in-between, I can breathe. And I can laugh and dream and enjoy the enchantment that is my Bear. I can drift and wait and find pieces of joy and cope. I can find joie de vivre. Joy of living. I feel it in my little girl’s humming of a most charming song, and the lilting pattern of her notes feels like bits of happy floating dreamily in the air. I see it in the crystal vase of pink tulips sitting in the window, delicate petals bravely spreading out, hiding the dead winterscape of broken branches, broken dreams, offering beauty and healing. She turned back to her book and I turned back to the dishes in the kitchen. And we filled the in-between with the hum of life. My daughter loves music. Has ever since she was a baby. She may look exactly like her Daddy, but the music? She gets that from me. We listen to music in the classroom, in the car, in the backyard on her iPod. And it’s all kinds of music. We go from Mozart to Putumayo Kids, from Glenn Miller to Journey. She’s just as likely to belt out “Dancing Queen” as she is to hum Bach’s Brandenburg Concerto No. 3 while she does her math. We permeate the air around us with music, so it’s no wonder that my girl breathes it all in and exhales her own lyrics and melodies, dancing her way through life like the little fairy sprite she is. She likes to seclude herself in the upstairs playroom to work on her new pieces, not letting a single note be heard until she declares its perfect place in her composition. Kevin and I loved to hear her announce an after-dinner performance. We clapped and “Brava”-ed and gave standing ovations at every front room recital. She put away her Literature binder, then turned to me and asked, “Do you want to hear my new song?” Her eyes shone with excitement, anticipating my answer. “You bet!” I replied, wondering what she’d come up with now. She grabbed her plastic microphone, and proceeded to pierce my heart with the lyrics she’d composed. They were not fancy or elaborate or groundbreaking. But they were God’s voice, speaking to me through my seven-year-old daughter. I’ve been struggling lately, unsure about this new life I have to live without Kevin. It’s hard. I hate it. I was promised a lifetime of love and happiness in all the wedding cards we received. Not one single card mentioned that his life would be much too short. I miss him every single minute of every single day. Sometimes His singing sounds an awful lot like my girl with her plastic microphone.